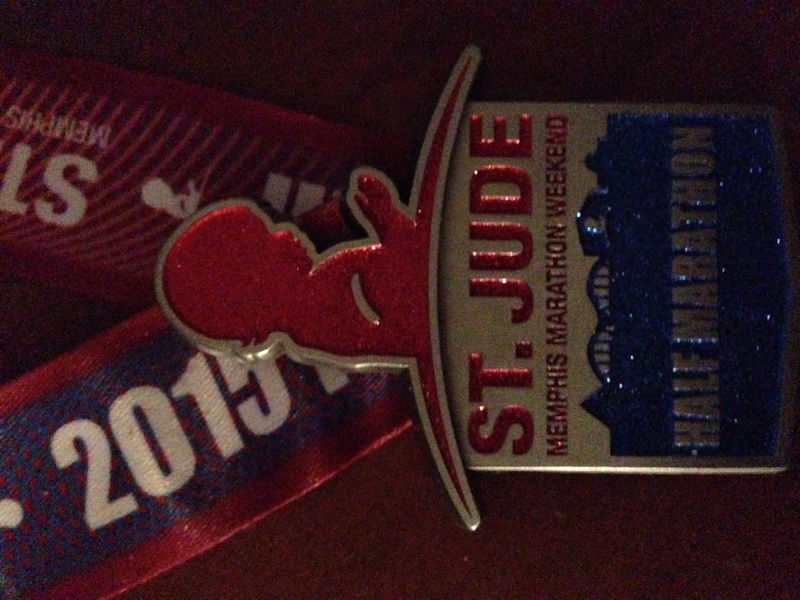 So today’s half marathon was not my best, nor was it my worst.It was a first, however.This was my first time running The St. Jude Half Marathon here in Memphis and my first time being involved with any fundraising for a race.Being involved in a event that raises money for a children’s hospital, especially like St. Jude, is a worthy cause. You would think that after running two full marathons this would be a breeze but it wasn’t.My training was spotty at best and lo and behold, about a week before the race I find myself fighting off a cold which had me hacking and coughing all week. I knew it wouldn’t be my finest race but made it from start to finish all the same. I am still a relatively new runner,all said and done, so every race has something to teach me and today was no different. The first couple things I learned at the race expo the day before.There was a panel of 3 elite runners speaking about their preparations and giving advice and these were things that stayed with me. You mind will want to quit before your body does. I experienced this in the last full marathon I did so I knew it to be true.I also experienced it today.I realized about mile 7, this wasn’t going to be the race I had hoped for.A wave of disappointment and panic passed through me and yet I had to finish the race.I had to find mental strategies and stamina to keep me motivated.I went a little slower and took it mile by mile.This brings me to another lesson. Set multiple goals for the race.This makes sense because once you feel defeated, it is hard to keep your head in the game.Aside from supporting St.Jude, I didn’t have a specific non-time related goal(even a specific time was not something I was dead set on.More on that later. )This is very wise and I will have to do it next time. Prepare to be emotional.Since this was my first time doing the St.Jude Half, it didn’t even occur to me that we would be running near the hospital and possibly seeing sick children, some parents, and hospital staff.This event showcases the city of Memphis in it’s best possible light.It is was a stellar sunny day and the support along the course, for such a meaningful purpose, was beautiful and heartwarming .Being emotional is not necessarily a bad thing and it can be inspiring.Nevertheless, it is something to be aware of.The next few lessons are more personal. I can be competitive.I don’t think I have ever admitted this to myself but it’s true.I may be competing with myself, knowing I am capable of doing better, but there it is.I know I am a winner for just participating and ” all that jazz ” but I would like to improve,get faster, run easier,and finish strong.It is ” part of it ” for me and the sooner I can admit it to myself, the sooner I can work with this part of myself. I need to set specific goals.I have held off on this because of what I mentioned above.It’s important to set goals, write them down, and even share them.I am talking about time goals, primarily.I have been reluctant to do this but in the long run, it may have held me back. I need to seek out ( more ) support.I have met with some running groups here and there but it needs to be more of a priority and more consistent.I am a solitary runner, mostly, but I could benefit from the knowledge and insight of others in the local running community.It appears from what I mentioned above, I may already have. I may need more shoe.I have been doing a minimalist type thing since I started back running about 3 1/2 years ago.I agree with its principles.I have been running on more grass and trails as well.That being said, I have been doing ROAD races on pavement.This occurred to me today running up North Parkway.It could be time for a more substantial shoe.Then again, it could be my lousy training, but it’s a consideration. These are all vital things for me to work on before my next race.If I choose to learn something from each race I participate in, it can only benefit me. That is the frame I choose to use. The next big one, for me, is the full marathon in Nashville, April 30th,my 3rd time around.You know the saying,” Third time is a charm.” I sure hope so. If you would like to make a contribution to St.Jude, any amount would make a difference.I have made personal donation and have a goal of $500 to reach by 12/31.If you would like to join me, here is the link to my page,thank you.